Often, I am asked why a customer’s system is not operating properly. In many of the cases I have limited operational experience of the customer’s fluid piping system. By breaking the system down into the pump, process and control elements, one can quickly understand how the piping system operates. Since most of our customers used our piping simulation software they will also include a system simulation file of their system in question. In this month’s article we will look at a crude oil desalination system, used to remove water and various minerals from the crude oil. 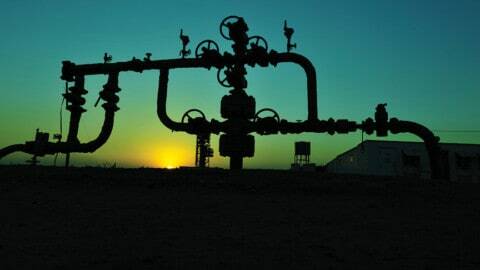 The crude oil desalination system is typically the first process system found in an oil refinery. Figure 1 below provides a piping schematic of the system in question. This system mixes a small amount of water with the crude to remove contaminants before sending it to the flash and separation towers. The crude is preheated, and water extracted from the second stage is added and the mixture is run through a mixing device before entering the first desalting unit. 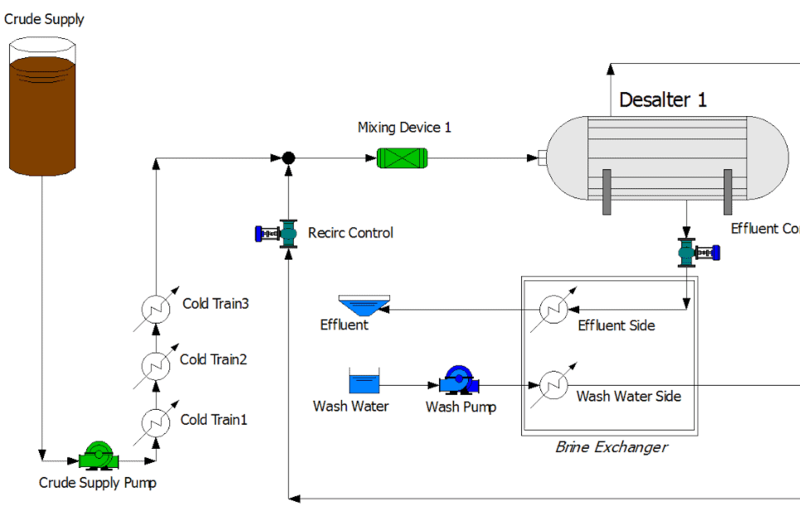 The first desalter separates the oil from the brine and sends the brine effluent out for treatment, and the cleaned crude stream to the second stage where the process is repeated. The crude from the second stage is sent for further processing. Once the system is built and placed in operation things change; equipment wears, deposits build up, replacements and modifications are made. Process or product requirements and raw material properties begin to vary. The initial system design no longer matches what the instruments are reporting. This is when the model becomes a great diagnostic tool. The key fact to remember is that if the reading’s no longer match the validated model, something has changed, and it isn’t the laws of physics upon which the model is based. 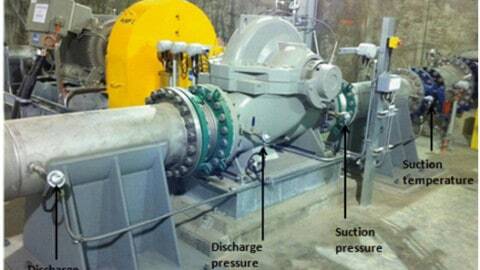 When comparing the piping system model to the actual system operation, if the difference between pumps suction and discharge pressures don’t match the model, then further investigation into the pump is warranted. When looking at the customer’s model, the first question I ask is, was the manufacturer’s supplied pump performance curve used in building the model? Surprisingly the answer is usually no. Having correct pump curves is essential to being able to troubleshoot piping systems without significant and costly trial and error methods. The pump curve helps determine if the problem is between the flanges or outside the flanges. A pump not operating on its curve is certainly suspect and should be inspected. If pressure drops across a valve, or if a heat exchanger or other device – or even a specific length of pipe – doesn’t match the model’s results, then that can lead you to a root cause. If the pressure is too high in the process elements, the flow path may be blocked with debris or buildup. Did the pressure drop too low? 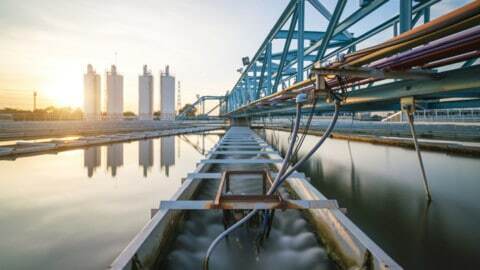 This could lead you to investigate whether there has been erosion, failure in a positioning device or control system error, or even potentially indicate there is a leak somewhere between the sensors. Coupling the comparison of model and actual flow rates with pressure drops is even more revealing. The key point is that consulting the model as a diagnostic tool can help identify root cause more rapidly by pointing us in the right direction. As designed, the three pumps are all running pretty close to their respective best efficiency points (BEPs) and valves are all within their control ranges. The pumps and the valves are all instrumented, but the individual process devices were not. 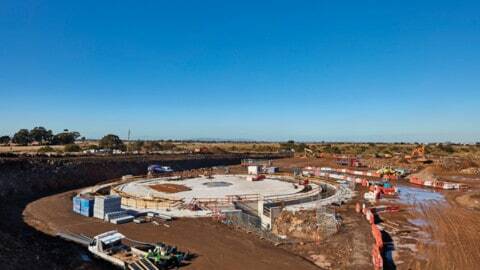 The water to crude volumetric ratio for each unit was designed to be around 5.2 per cent. Refer to Table 1 for initial system design conditions, with available instrumentation data highlighted in blue. The operator then took measurements from all the instrumented devices. The readings are shown in Table 2 with design values in brackets for comparison.After some time, an operator noted some noise coming from the effluent control valve. The operator checked the other valves and noted that the Recirc Valve was 100 per cent open and no longer controlling flow, and sampling the mixes going into the desalters showed the water to crude volumetric ratio going in to Desalter 1 had dropped to 4.8 per cent, and going in to Desalter 2 was now 5.6 per cent. Having a system model that provides the expected parameters and pump curves for each pump in the system can be of great benefit in this scenario. 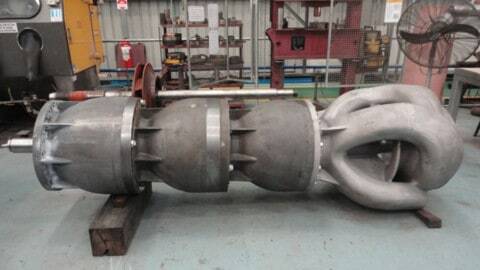 One possible cause for the reduced flow in the recirc line would be pump damage or impeller corrosion, which would result in the pump operating off of its curve. Fortunately, we have the pump curve; a quick review of where the pump’s operating point falls shows that it is still on the curve and operating properly so we don’t have to shut the system down and take the pump apart to see. 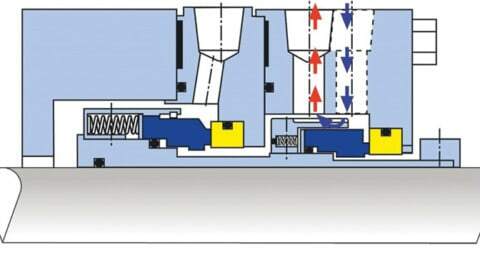 The noise from the effluent control valve indicates there may be cavitation or choked flow in the valve; the as-designed model indicates choked conditions would be flow over 271gpm or pressure drop over 76 psi. Since our set point is 270, we are close, but still OK, so the noise is likely due to an increase pressure drop across the valve. Checking the gage we see the pressure drop across the valve is 82psi, and the upstream pressure is higher than originally modeled. Looking at the wash water control valve, we can see it is operating properly, but opens more than the model would expect. We can verify the downstream pressure from that is also higher than originally modelled. The pressure is higher than expected upstream of the Mixing Device 2, but lower downstream of Desalter 2. Now we can zero in on a probable cause – plugging in Mixing Device 2 which turns out to be the case. This scenario highlights another way that system analysis is critical, not only in the design phase, but in operation and troubleshooting. The two control valves exhibiting the errant behavior were located away from the actual problem. If we took a component view there may have been more investigation into the valves or even the pump to see what the problem was, but with a validated system model the actual readings from the system can be compared to the expected values in the model, and can be a valuable troubleshooting tool to have in your toolbox, especially in areas or parts of your system where instrumentation is not installed. When you take ownership of operating your system, make sure you get copies of the system analyses – including all the pump curves – and keep them up-to-date. When something goes wrong it will be an invaluable tool for troubleshooting and will be accessible with a touch of a button. Ray T Hardee, PE, is the Chief Engineer and a principle founder of Engineered Software Inc., creators of PIPE-FLO® and PUMP-FLO® software. The PIPE-FLO product line helps some of the largest companies across a variety of industries find hidden profit in the design and operation of their fluid piping systems through simulation software, modelling services, and training opportunities. Hardee is a member of the Hydraulics Institute, ASME Energy Assessment for Pumping Systems standards committee and ISO Pumping System Energy Assessment committee. Hardee’s publications include Piping System Fundamentals and contributions to HI’s Pump Life Cycle Cost and Optimizing Piping Systems. He can be reached at SimGuyRay@eng-software.com.